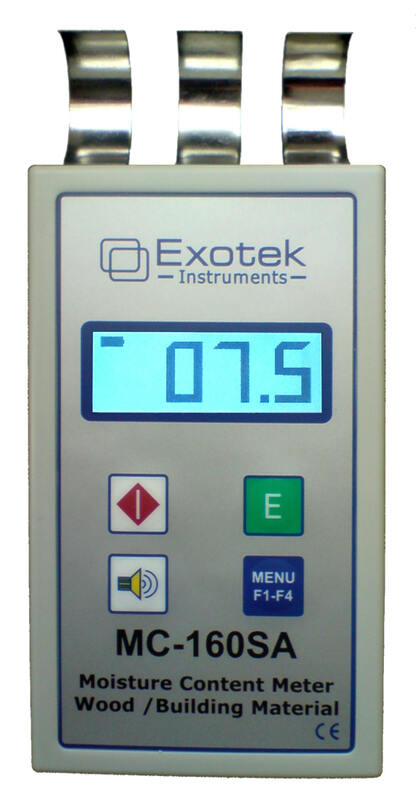 The Exotek Instruments series is a new generation of microprocessor controlled, pocket size handheld moisture meters. For quick and accurate non-destructive determination of the moisture content in wood and building materials as well as locating wet areas in floors, roofs and walls made of homogeneous material. It works on the principle of measuring the dielectric constant of the material. The field penetration depth is approximately 50 mm. It can be used under outdoor and indoor conditions. Choice of material code makes measurements more accurate. There are 10 selectable density groups for wood and 6 groups for building materials available. When making Bore hole Test's checking the Air Humidity, Relative Humidity (RH) is a more appropriate term. For this reason, the MC-160SA is programmed to calculate the RH value from the moisture content value (only for building material). The User's Manual is available in the following Languages: Dutch, English, Finnish, French, German, Norwegian, Swedish, Russian, Polish. Anyone who needs a professional quality tool to inspect wood and building materials for accurate moisture content or relative humidity.